The black hole mass - bulge scaling relations is often seen as one fundamental properties of galaxy explained by a self-regulation of BH and bulge growth. Alternative explanations are becoming popular and the CARS data set should be able to allow to check which AGN or host galaxy parameters are correlating with deviations from the mean scaling relations to explore their main regulating processes.The large multi-wavelength data set of the CARS survey, covering deep imaging as well as high-resolution spectroscopy, is ideal to study BH mass - bulge relations of nearby quasars. 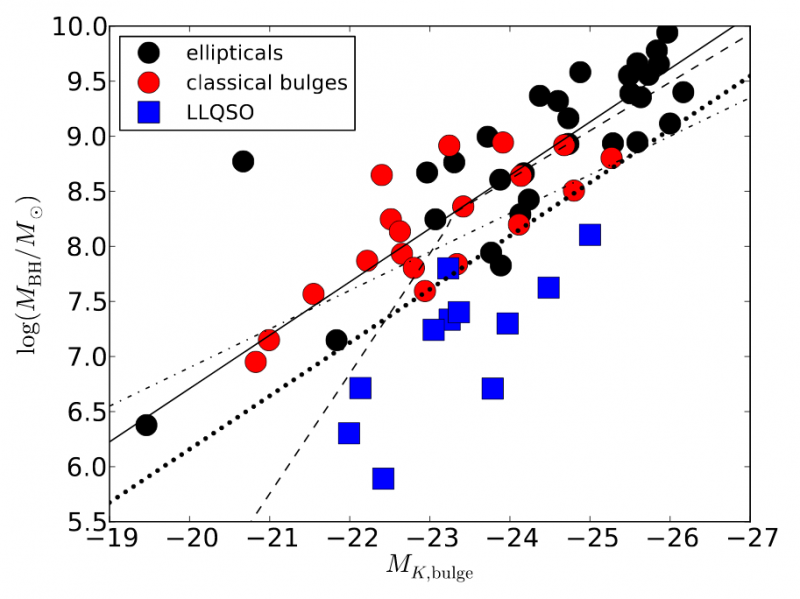 There has been evidence that active galaxies, especially those with high accretion rates, lie significantly offset from BH mass - bulge mass/luminosity relations of local inactive galaxies (e.g. Urrutia et al. 2012, ApJ 757, 125; Busch et al. 2014, A&A 561, A140). CARS will allow us to follow-up on this in a systematic way. Black hole mass against absolute K-band magnitude of the bulge component for a sub-sample of the CARS mother sample as published by Busch et al. (2014). Data for inactive galaxies have been compiled from Kormendy & Ho (2013) for comparison. The bulge appear overluminous or the BH mass under-massive with respect to the inactive galaxy relations. One key question is whether the offset is similar in the stellar velocity dispersion and if we can identify a correlation with the offset from the inactive relation towards other AGN host galaxy properties.